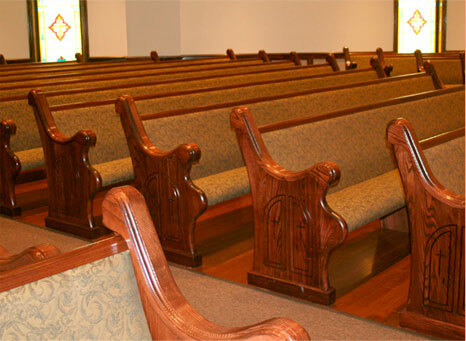 King Church Furniture manufactures and sells custom church pews in a wide variety of styles to churches, synagogues, temples, and houses of worship for all religious denominations. 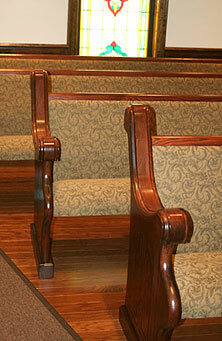 New church pews add beauty, comfort, and life to your sanctuary. 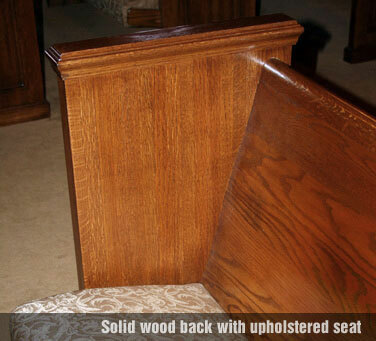 Whether a small, simple church or the grandest of cathedrals, our pews are custom built just for you. It is our top quality and unbeatable prices that set us apart from the rest. Church Pews (sometimes called church benches) are the unique furnishings that differentiate your church building from all other gathering places. The mere presence of pews signifies a place of worship and reverence. Since first being introduced as stone benches in the 13th century, pews have been a mainstay in church buildings worldwide. They have become a central aspect of church architecture. 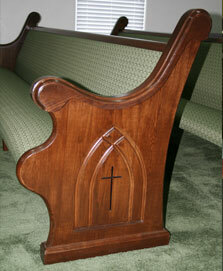 The endeavor of purchasing new pews for your sanctuary is a new experience for most. 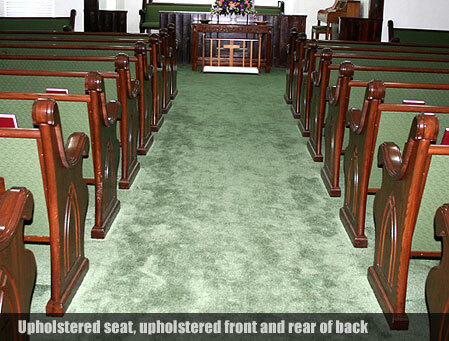 Since quality pews have a life-span of decades, purchasing pews is something usually done only once in a lifetime. And since they will be a major component of your church for years to come, the task becomes even more momentous. But, we can help. Let us guide you thru the process with options and information necessary to make an informed decision. 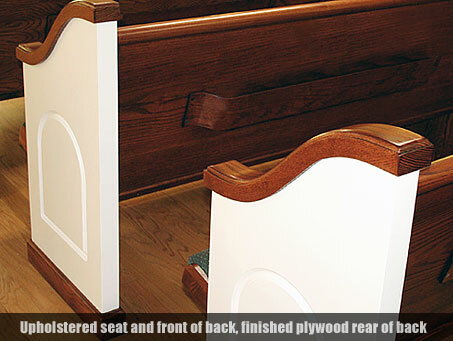 After all, pews have been our business for more than sixty years. 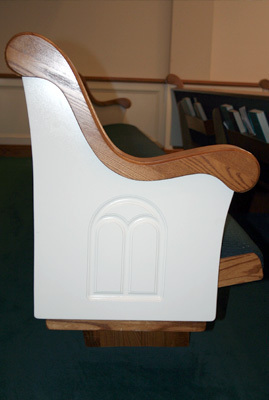 New pews are customized to your specific needs. You will choose the size and style that best fits your sanctuary. You will choose the body style, the end style, the wood species, the fabric and the finish color. King Church Furniture offers a vast selection of all these options in our church pews for sale and can help make these decisions effortless. The Fully Upholstered pew is not only the most comfortable but also the most economical. The fully upholstered pew body has an upholstered seat, an upholstered front of the back and fabric covering the rear of the back. 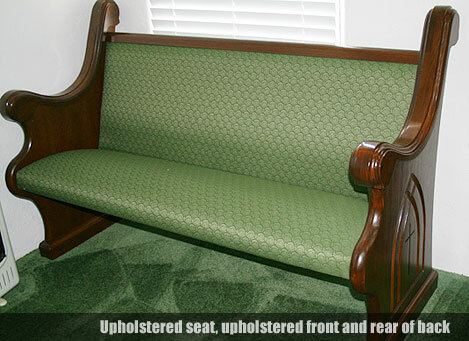 The comfort and savings offered by the fully upholstered pew make it the most popular choice of today’s churches. 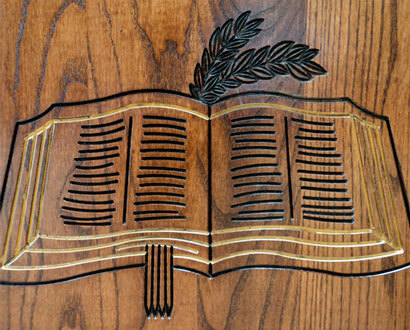 King Church Furniture uses ¾” plywood as our upholstering medium. 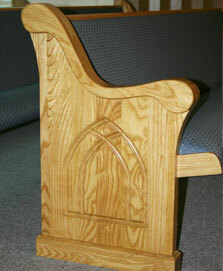 Our plywood pew seat is reinforced for strength and stability with a 1 1/2” x 2 1/2” solid wood brace. 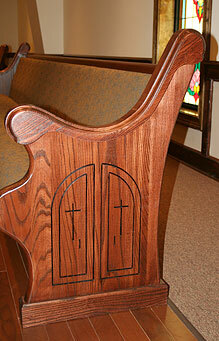 This method of construction is considered the best by the Church Furniture Manufacturing Association. 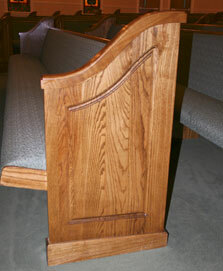 Pew ends are the major “style” component of the pew. 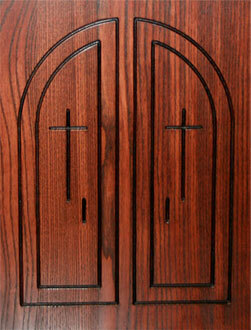 Whether traditional or modern, simplistic or intricate, King Church Furniture has an end style that is perfect for you. 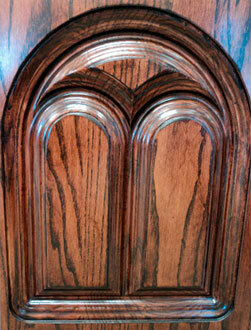 Our stained ends are manufactured using only solid hardwoods. The timeless beauty and strength of solid wood is unquestionable. 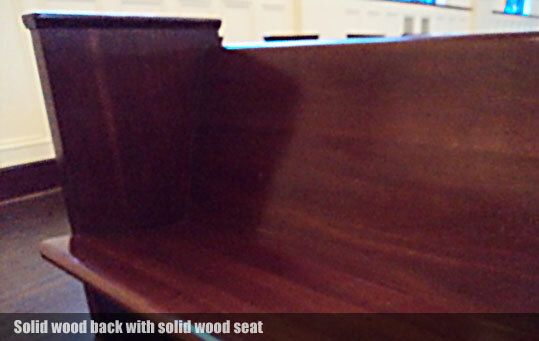 And, according to Church Furniture Manufacturing Associates’ website, “Solid wood pew ends will have a lifespan of 45 – 55 years before needing replacement (on average).”Here are a few examples of our quality, solid hardwood ends. Our colonial ends refer to ends that have a “white” body and stained caps and heels. To manufacture the “white” portion of the end, a product called MDF (medium density fiberboard) is used. As a strong proponent of solid wood, we were hesitant to switch from using a painted wood to MDF. But in giving it a try, we learned that MDF can be sanded to a smoother surface than wood and can be finished without any visible grain. It is a strong, stable material that will last indefinitely. Of course, the stained end caps and heels are still constructed of solid hardwood. Here are a few examples of our quality, colonial ends. 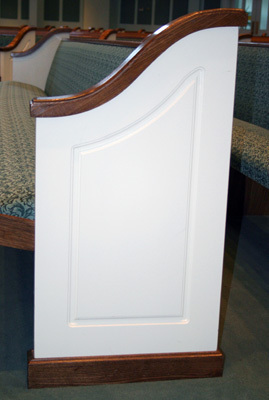 Pew ends can be customized with a route symbolically significant to your church, your denomination or to complement your architectural style. The options are only limited by your imagination. Here are a few examples of what we have done. 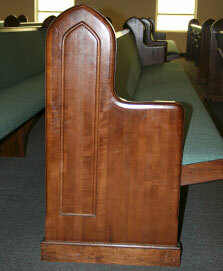 All pews manufactured by King Church Furniture will come standard with bookracks. Our bookracks have a four-book capacity complete with communion cup, card and pencil holders. However, the communion cup holders and/or the card and pencil holders can be left-off depending on your preference. 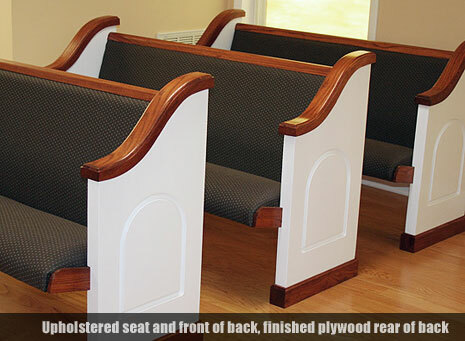 There are many other options your church may consider to add beauty and comfort to your pews such as an Oval Top Cap or Lumbar Support. Remember, there is no right or wrong choices for your pews – as long as King Church Furniture is your choice to manufacture them.